We understand quite clearly, what it means to run your own website. It takes really much time and effort to have it look the way you desire. However, it’s quite a common thing when you need someone’s help with your website’s improving. It might be an installation or customization case or you may have a wish to delegate someone a part of workflow. In all the cases you may need to share your access and it’s a good thing to know how to do it. Guest – views public site and public articles. Manager – a member of this group can do everything in the front and back end of the site except change Global Permissions and Component Options. Administrator group members by default can access the Options screens for each component. Registered group members can login to the site. Editor group members have the Edit permission. Super Users – members of this group have super user permissions throughout the site. The super users can perform any action on the site. These are several steps of how to provide the access to your admin dashboard if you need our help. Login to your Joomla admin panel and select Users → Manage → Add New User. Fill in Account Details form: configure the name, login name and password you like. The email you need is support@elfsight.com . 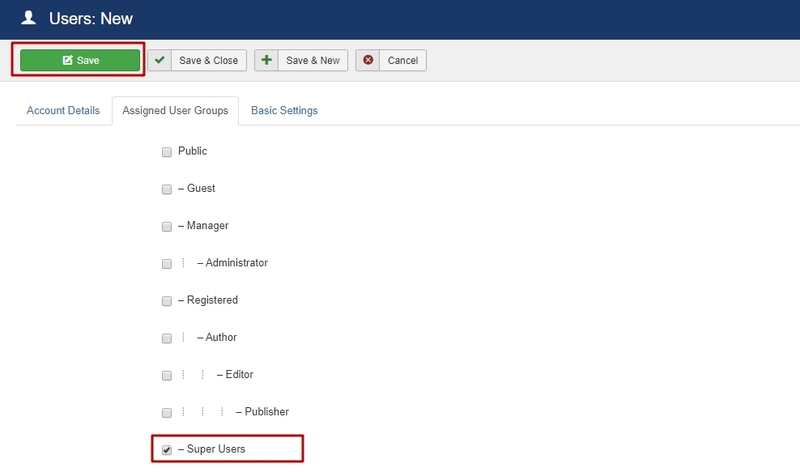 Click on the Assigned User Groups tab, select Super Users and save the result. After all the steps, provide us with Login name and Password you had created. Now we are able to help you! When the access is not required any longer, you can delete a user. Click on User tab and press Manage. Select the user you need and press the Delete button. You may feel uncertain about the sharing access situation and we understand that. Anyhow, you are offered to let someone in your personal data and it’s normal to hesitate. Although safety question doesn’t have the certain answer, we ensure you our dev team takes any precautions and are extremely careful with our users’ websites. So if you were asked by our development team to provide them with temporary access to your admin panel, you are aware that this can be trusted.